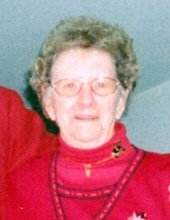 Marian C. Sulecki Wolfe, age 102, of Lawrence Park Twp., passed away on Tuesday, February 5, 2019 at Brevillier Village. She was born in Cleveland, OH on March 30, 1916, a daughter of the late Andrew and Julia (Kalinowski) Sulecki. She resided in Erie for most of her life. Marian was a member of St. Mark the Evangelist Roman Catholic Church. She was a dedicated homemaker and enjoyed gardening and knitting caps for premature babies born in local hospitals. In addition to her parents, Marian was preceded in death by her husband, Conrad “Chuck” Wolfe; her son, Robert C. Wolfe; four sisters: Margaret Triber, Eleanor Gorecki, Emilia Pius and Elizabeth Palatos and two brothers, Frank and John Sulecki. Survivors include her daughter-in-law, Elizabeth A. Wolfe of Lawrence Park Twp. and several nieces and nephews. Friends are invited to attend a Memorial Mass on Wednesday, February 13th at 11 a.m. at the St. Barnabas Chapel of Brevillier Village (Harborcreek Twp.). The Rev. Tom Trocchio, Pastor of St. Mark the Evangelist R.C. Church will preside. Marian will be laid to rest privately at Wintergreen Gorge Cemetery, next to her husband. In lieu of flowers, memorial contributions may be made to Brevillier Village, 5416 East Lake Rd., Erie, PA 16510 or to St. Mark the Evangelist R.C. Church, 695 Smithson Ave., Erie, PA 16511. To send flowers or a remembrance gift to the family of Marian C. Wolfe, please visit our Tribute Store. The Memorial Service will be conducted by the Rev. Tom Trocchio, Pastor of St. Mark the Evangelist R.C. Church. "Email Address" would like to share the life celebration of Marian C. Wolfe. Click on the "link" to go to share a favorite memory or leave a condolence message for the family.